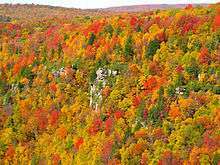 West Virginia i/ˌwɛst vərˈdʒɪnjə/ is a state located in the Appalachian region of the Southern United States. It is bordered by Virginia to the southeast, Kentucky to the southwest, Ohio to the northwest, Pennsylvania to the north (and, slightly, east), and Maryland to the northeast. 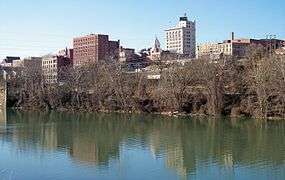 West Virginia is the 41st largest by area, the 38th most populous, and has the second lowest household income of the 50 United States. The capital and largest city is Charleston. 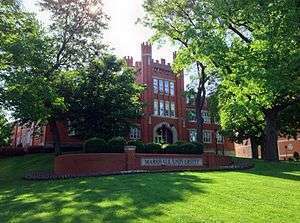 Many ancient man-made earthen mounds from various prehistoric mound builder cultures survive, especially in the areas of Moundsville, South Charleston, and Romney. The artifacts uncovered in these give evidence of village societies. They had a tribal trade system culture that crafted cold-worked copper pieces. 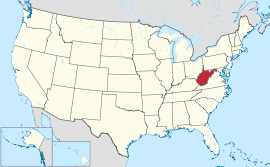 West Virginia was originally part of the British Virginia Colony from 1607 to 1776 and the western part of the state of Virginia (which was commonly referred as Trans-Allegheny Virginia before the formation of West Virginia) from 1776 to 1863. Long discontented with electoral malapportionment and underrepresentation in the state legislature, its residents became sharply divided over the issue of secession from the Union during the Civil War. Residents of the western and northern counties set up a separate government under Francis Pierpont in 1861, which they called the "restored" government. 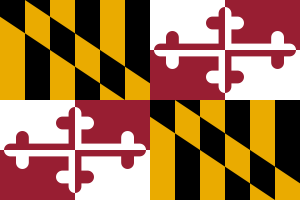 Most voted to separate from Virginia and the new state was admitted to the Union in 1863. In 1864 a state constitutional convention drafted a constitution, which was ratified by the legislature without putting it to popular vote. West Virginia abolished slavery and temporarily disfranchised men who had held Confederate office or fought for the Confederacy. For more details on this topic, see Prehistory of West Virginia. "Maize (corn) did not make a substantial contribution to the diet until after 1150 BP", to quote Mills (OSU 2003). Eventually, tribal villages began relying heavily on corn to feed their turkey flocks, as Kanawha Fort Ancients practiced bird husbandry. The local Indians made corn bread and a flat rye bread called "banick" as they emerged from the protohistoric era. A horizon extending from a little before the early 18th century is sometimes called the acculturating Fireside Cabin culture, when trading posts along the Potomac and James rivers spread across the state. King Charles II of England, in 1661, granted to a company of gentlemen the land between the Potomac and Rappahannock rivers, known as the Northern Neck. The grant finally came into the possession of Thomas Fairfax, 6th Lord Fairfax of Cameron, and in 1746, a stone was erected at the source of the North Branch Potomac River to mark the western limit of the grant. A considerable part of this land was surveyed by George Washington between 1748 and 1751. The diary kept by the surveyor indicates that there were already many squatters, largely of German origin, along the South Branch Potomac River. Christopher Gist, a surveyor in the employ of the first Ohio Company, which was composed chiefly of Virginians, explored the country along the Ohio River north of the mouth of the Kanawha River between 1751 and 1752. The company sought to have a fourteenth colony established with the name "Vandalia". Many settlers crossed the mountains after 1750, though they were hindered by Native American resistance. Few Native Americans lived permanently within the present limits of the state, but the region was a common hunting ground, crossed by many trails. During the French and Indian War the scattered British settlements were almost destroyed. In 1774, the Crown Governor of Virginia John Murray, 4th Earl of Dunmore, led a force over the mountains, and a body of militia under then-Colonel Andrew Lewis dealt the Shawnee Indians, under Hokoleskwa (or "Cornstalk"), a crushing blow during the Battle of Point Pleasant at the junction of the Kanawha and the Ohio rivers. At the Treaty of Camp Charlotte concluding Dunmore's War, Cornstalk agreed to recognize the Ohio as the new boundary with the "Long Knives". By 1776, however, the Shawnee had returned to war, joining the Chickamauga. Native American attacks continued until after the American Revolutionary War. During the war, the settlers in western Virginia were generally active Whigs and many served in the Continental Army. However, Claypool's Rebellion of 1780–1781, in which a group of men refused to pay taxes imposed by the Continental Army showed war-weariness in West Virginia. For more details on this topic, see Virginia. Abraham Lincoln Walks at Midnight, a statue on the grounds of the West Virginia State Capitol. 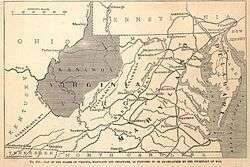 West Virginia was the only state in the Union to separate from a Confederate state (Virginia) during the American Civil War. In Richmond on April 17, 1861, the 49 delegates from the future state of West Virginia voted 17 in favor of the Ordinance of Secession (of Virginia from the United States), 30 against, and 2 abstentions. 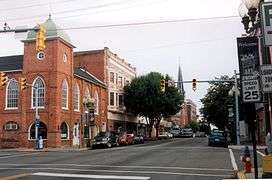 Almost immediately after the vote to proceed with secession from the Union prevailed in the Virginia General Assembly, a mass meeting at Clarksburg recommended that each county in northwestern Virginia send delegates to a convention to meet in Wheeling on May 13, 1861. When this First Wheeling Convention met, 425 delegates from 25 counties were present, though more than one-third of the delegates were from the northern panhandle area, but soon there was a division of sentiment. The Wheeling Convention, which had taken a recess until August 6, reassembled on August 20 and called for a popular vote on the formation of a new state and for a convention to frame a constitution if the vote should be favorable. At the October 24, 1861 election, 18,408 votes were cast for the new state and only 781 against. The veracity of these election results has been questioned, since the Union army then occupied the area and Union troops were stationed at many of the polls to prevent Confederate sympathizers from voting. Most of the affirmative votes came from 16 counties around the Northern panhandle. Over 50,000 votes had been cast on the Ordinance of Secession, yet the vote on statehood garnered little more than 19,000. In Ohio County, home to Wheeling, only about one-quarter of the registered voters cast votes. At the Constitutional Convention in November 1861, a Mr. Lamb of Ohio County and a Mr. Carskadon claimed that in Hampshire County, out of 195 votes only 39 were cast by citizens of the state; the rest were cast illegally by Union soldiers. In most of what would become West Virginia, there was no vote at all as two-thirds of the territory of West Virginia had voted for secession and county officers were still loyal to Richmond. Votes recorded from pro-secession counties were mostly cast elsewhere by Unionist refugees from these counties. The convention began on November 26, 1861 and finished its work on February 18, 1862; the instrument was ratified (18,162 for and 514 against) on April 11, 1862. On May 13 the state legislature of the reorganized government approved the formation of the new state. An application for admission to the Union was made to Congress, and on December 31, 1862, an enabling act was approved by President Abraham Lincoln admitting West Virginia, on the condition that a provision for the gradual abolition of slavery be inserted in its constitution. While many felt that West Virginia's admission as a state was both illegal and unconstitutional, Lincoln issued his Opinion on the Admission of West Virginia finding that "the body which consents to the admission of West Virginia is the Legislature of Virginia", and that its admission was therefore both constitutional and expedient. During the Civil War, Union General George B. McClellan's forces gained possession of the greater part of the territory in the summer of 1861, culminating at the Battle of Rich Mountain, and Union control was never again seriously threatened, despite an attempt by Robert E. Lee in the same year. In 1863, General John D. Imboden, with 5,000 Confederates, overran a considerable portion of the state. Bands of guerrillas burned and plundered in some sections, and were not entirely suppressed until after the war ended. The Eastern Panhandle counties were more affected by the war, with military control of the area repeatedly changing hands. December 18 and 19, 2003. Significant snowstorm in West Virginia. The United States Census Bureau estimates that the population of West Virginia was 1,844,128 on July 1, 2015, a −0.48% decrease since the 2010 United States Census. 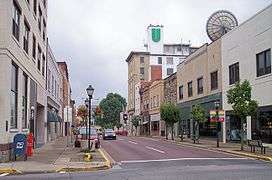 The center of population of West Virginia is located in Braxton County, in the town of Gassaway. 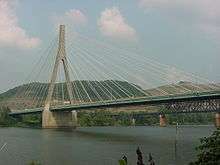 The U.S. Bureau of Economic Statistics reported that in 2014 West Virginia's economy grew twice as fast as the next fastest growing state East of the Mississippi River, ranking third alongside Wyoming and just behind North Dakota and Texas among the fastest growing states in the United States. Tourism contributed $4.27 billion to the state's economy and employed 44,400 people in 2010, making it one of the state's largest industries. Many of the tourists, especially in the eastern mountains, are drawn to the region's notable opportunities for outdoor recreation. Canaan Valley is a popular winter sports destination, Seneca Rocks is one of the premier rock climbing destinations in the eastern U.S., the New River Gorge/Fayetteville area draws rock climbers as well as whitewater enthusiasts, and the Monongahela National Forest is popular with hikers, backpackers, hunters, and anglers. Alongside outdoor recreation opportunities, the state offers a number of historic and cultural attractions. Harpers Ferry National Historical Park is a historic town situated at the confluence of the Shenandoah and Potomac Rivers. Harpers Ferry was the site of John Brown's 1859 slave revolt and raid on the US Armory and Arsenal. The town is also the approximate midpoint of the Appalachian Trail and home to the Appalachian Trail Conservancy. The Greenbrier hotel and resort, originally built in 1778, has long been considered a premier hotel frequented by numerous world leaders and U.S. Presidents over the years. West Virginia is also home to the Green Bank Telescope at the National Radio Astronomy Observatory. 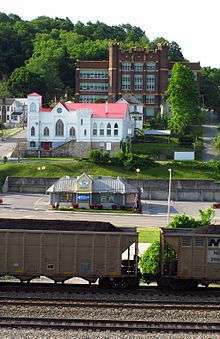 The main building of Weston State Hospital, the largest hand-cut sandstone building in North America, second worldwide only to the Kremlin in Moscow, is also located in West Virginia. Tours of the building, which is a National Historic Landmark and member of the National Civil War Trail, are offered seasonally and by appointment year round. West Virginia is also home to a number of popular festivals throughout the year. West Virginia's highest court is the Supreme Court of Appeals. The Supreme Court of Appeals of West Virginia is the busiest appellate court of its type in the United States. West Virginia is one of 11 states with a single appellate court. The state constitution allows for the creation of an intermediate court of appeals, but the Legislature has never created one. The Supreme Court is made up of five justices, elected in partisan elections to 12-year terms. Since 2000, West Virginians have supported the Republican candidate in every presidential election. The state is regarded as a "deep red" state at the federal level. In the 2012 presidential election Republican Mitt Romney won the state defeating Democrat Barack Obama with 62% of the vote to 35% for Obama. In the 2016 presidential election, Republican Donald Trump won the state with 68.7% of the popular vote, the second-highest percentage voting for Trump of any state. Before 2000, West Virginia had been reckoned as a Democratic stronghold at the national level. From 1932 to 1996, the state voted in favor of the Republican Party three times—in the national Republican landslides of 1956, 1972 and 1984. West Virginia University in Morgantown boasts the PRT (personal rapid transit) system, the state's only single rail public transit system. Developed by Boeing, the WVU School of Engineering and the Department of Transportation, it was a model for low-capacity light transport designed for smaller cities. Recreational transportation opportunities abound in West Virginia, including hiking trails, rail trails, ATV off road trails, white water rafting rivers, and two tourist railroads, the Cass Scenic Railroad and the Potomac Eagle Scenic Railroad. West Virginia is home to college sports teams from two schools — West Virginia and Marshall — that play in NCAA Division I. 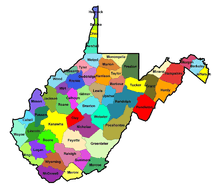 West Virginia is also home to several professional minor league baseball, football, soccer, and other sports teams. 1 2 3 "Table 1. Annual Estimates of the Resident Population for the United States, Regions, States, and Puerto Rico: April 1, 2010 to July 1, 2015" (CSV). U.S. Census Bureau. December 26, 2015. Retrieved December 26, 2015. ↑ "Appalachian Region: Counties in Appalachia". Appalachian Regional Commission. Retrieved November 13, 2007. ↑ David Thier (April 18, 2010). "W.Va. Stalagmite Points to Surprising Carbon Footprint". aolnews.com. ↑ Grady, John (July 16, 2012). "The Birth of a State". New York Times. Retrieved July 27, 2012. ↑ "WVculture.org". WVculture.org. Retrieved July 31, 2010. ↑ ""Chapter Twelve "Reorganized Government of Virginia Approves Separation"". Wvculture.org. Retrieved July 31, 2010. ↑ A detailed list of delegate names and votes are located in Virgil Lewis' How West Virginia Was Made, pg. 30, and also Charles Ambler's A History of West Virginia, 1933, pg. 309. Missing from both lists, however, are the delegates for McDowell County, William P. Cecil and Samuel L. Graham, who also represented Tazewell and Buchanan counties, which are still part of Virginia. Both Cecil and Graham voted in favor of the Ordinance. See Pendleton, William C. History of Tazewell County and Southwest Virginia, 1748–1920, Richmond, 1920, pgs. 600 and 603. ↑ Those not voting were Thomas Maslin of Hardy County and Benjamin Wilson of Harrison County. Ambler, Charles H. A History of West Virginia, pg. 309, footnote 32. ↑ The United States Constitution provides that no state may be divided without its consent. ↑ "West Virginia Statehood". Wvculture.org. Retrieved July 31, 2010. ↑ "Opinion of Abraham Lincoln on the Admission of West Virginia". Wvculture.org. Retrieved July 31, 2010. ↑ Virginia v. West Virginia, 78 U.S. 39 (1870). ↑ "Researching Your Civil War Ancestor". Wvculture.org. Retrieved July 2, 2010. ↑ "West Virginia House Concurrent Resolution No. 37, signed into law June 2009". State of West Virginia. Retrieved February 18, 2010. ↑ "State Facts". State of West Virginia. Retrieved November 12, 2009. ↑ "Land and Water Area of States, 2000". Information Please. 2000. Retrieved July 7, 2010. ↑ "Elevations and Distances in the United States". U.S Geological Survey. April 29, 2005. Retrieved November 9, 2006. ↑ "FS.fed.us". FS.fed.us. Retrieved July 31, 2010. ↑ Coney, Peter J (1970). "The Geotectonic Cycle and the New Global Tectonics". Geological Society of America Bulletin. 81 (3): 739–748. doi:10.1130/0016-7606(1970)81[739:tgcatn]2.0.co;2. Abstract: "Mountain complexes result from irregular successions of tectonic responses due to sea-floor spreading, shifting lithosphere plates, transform faults, and colliding, coupled, and uncoupled continental margins." 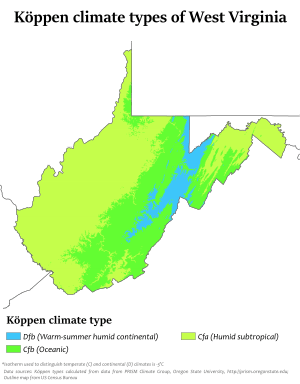 ↑ "West Virginia USDA Plant Hardiness Zone Map". plantmaps.com. Retrieved November 11, 2010. ↑ "West Virginia University data". West Virginia University Health Office. Retrieved July 7, 2010. ↑ "Population and Population Centers by State: 2000". United States Census Bureau. Retrieved December 6, 2008. ↑ "American FactFinder". US Census. Retrieved August 7, 2014. ↑ "Ancestry 2000, Census 2000 Brief" (PDF). census.gov. US Census Bureau. Retrieved August 24, 2013. ↑ "National Vital Statistics Reports, Volume 56, Number 7, (12/5/07)" (PDF). Retrieved July 31, 2010. ↑ "An Introduction to West Virginia's Ethnic Communities". Wvculture.org. Retrieved July 31, 2010. ↑ "West Virginia (USA): State, Major Cities, Towns & Places". City Population. February 19, 2011. Retrieved July 13, 2015. ↑ How religious is your state? ↑ "The World Bank: World Development Indicators database", World Bank. September 27, 2010. Accessed December 11, 2010. ↑ "State Rankings-Statistical Abstract of the United States-Persons 25 Years Old and Over With a Bachelor's Degree or More, 2004". Census.gov. January 7, 2009. Retrieved July 31, 2010. 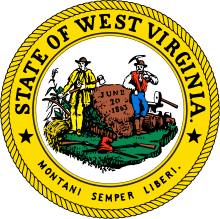 ↑ "EIA State Energy Profiles: West Virginia". June 12, 2008. Retrieved June 24, 2008. ↑ EIA (July 27, 2012). "Electric Power Monthly Table 1.17.A.". United States Department of Energy. Retrieved August 15, 2012. ↑ EIA (July 27, 2012). "Electric Power Monthly Table 1.17.B.". United States Department of Energy. Retrieved August 15, 2012. ↑ "Food Tax". State of West Virginia. Retrieved April 22, 2014. ↑ "West Virginia's Largest Private Employers for March 2009." West Virginia WorkForce. 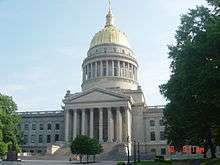 ↑ "Tomblin: Rainy Day Fund to fill budget gap", Charleston Gazette. January 8, 2014. Accessed April 12, 2014. ↑ "Full WV Legislature passes budget bill, The State Journal. March 14, 2014. Accessed April 12, 2014. ↑ "W.Va. governor signs budget that taps reserves", Washington Times. March 20, 2014. Accessed April 12, 2014. ↑ "State Exports via West Virginia", U.S. Census Bureau. March 26, 2014. Accessed April 12, 2014. ↑ "Economic Confidence Still Highest in D.C. in 2013. Confidence improved in most states; West Virginia still least confident", Gallup. February 10, 2014. Accessed April 14, 2014. ↑ "America's Top States for Business 2013", CNBC. July 9, 2013. Accessed April 14, 2014. ↑ "2014 State New Economy Index", Information Technology and Innovation Foundation. June 11, 2014. Accessed August 16, 2014. ↑ "CBER Calculates Impact from	Chemical Spill into Elk	River", Marshall University Center for Business and Economic Research. February 4, 2014. Accessed April 12, 2014. ↑ "Widespread Economic Growth in 2012", U.S. Bureau of Economic Analysis. June 6, 2013. Accessed April 12, 2014. ↑ "Governor Releases July Edge Business Report", West Virginia Department of Commerce. July 9, 2013. Accessed April 12, 2014. ↑ "Regional and State Unemployment – 2013 Annual Averages", U.S. Bureau of Labor. February 28, 2014. Accessed April 12, 2014. 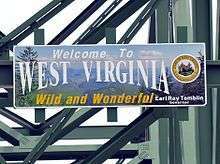 ↑ "West Virginia's February Unemployment Rate at 6.0 Percent", WorkForce West Virginia. March 18, 2014. Accessed April 12, 2014. ↑ "Labor Market Information by West Virginia County February 2014", WorkForce West Virginia. March 25, 2014. Accessed April 12, 2014. ↑ "State Personal Income 2013", U.S. Bureau of Economic Analysis. March 25, 2014. Accessed April 11, 2014. ↑ "Income Equality by State", Economic Policy Institute. February, 2014. Accessed April 11, 2014. ↑ "United Van Lines annual migration study reveals Oregon as top moving destination of 2013", United Van Lines. January 2, 2014. Accessed April 12, 2014. ↑ "West Virginia Economic Outlook 2014", West Virginia University College of Business and Economics. March 31, 2014. Accessed April 12, 2014. 1 2 "2012 County/Metro Population Estimates", U.S. Census Bureau. March 14, 2013. Accessed April 12, 2014. ↑ "Gallup-Healthways Well-Being Index 2013", Gallup-Healthways. February 20, 2013. Accessed April 12, 2014. ↑ ", Gallup. March 25, 2014. Accessed April 14, 2014. ↑ "KIDS COUNT Data Center", KIDS COUNT Data Center. April 1, 2014. Accessed April 12, 2014. ↑ "2013 KIDS COUNT Data Book", KIDS COUNT Data Center. June 24, 2014. Accessed April 12, 2014. ↑ "Local economy is tough on marriages", Charleston Gazette. March 18, 2014. Accessed April 12, 2014. ↑ "America's Health Rankings: 2013", United Health Foundation. December 11, 2013. Accessed April 12, 2014. ↑ "County Health Rankings Show Healthiest and Least Healthy Counties in Every State", Robert Wood Johnson Foundation. March 20, 2013. Accessed April 12, 2014. ↑ "Japan Shrinks", Wilson Quarterly. Spring 2012. Accessed April 12, 2014. ↑ "2012 County/Metro Population Estimates", U.S. Centers for Disease Control. April 10, 2012. Accessed April 12, 2014. ↑ "Prevalence of Drug Use in Pregnant West Virginia Patients", West Virginia Health Care Authority. July 1, 2010. Accessed April 12, 2014. ↑ "Results from the 2012 National Survey on Drug Use and Health: Summary of National Findings", U.S. Substance Abuse and Mental Health Services Administration. September 2013. Accessed April 12, 2014. ↑ Hendryx, Michael (2009). 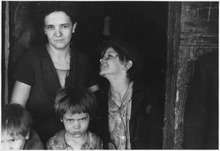 "Mortality from heart, respiratory, and kidney disease in coal mining areas of Appalachia". Int. Arch. Occup. Environ. Health. 82: 243–249. doi:10.1007/s00420-008-0328-y. ↑ Leip, David. "Presidential General Election Results Comparison – West Virginia". US Election Atlas. Retrieved November 18, 2016. ↑ "The Latest: GOP maintains majority in West Virginia Senate". Miami Herald. November 9, 2016. Retrieved November 9, 2016. ↑ McElhinny, Brad (November 9, 2016). "W.Va. Republicans celebrate Trump win and GOP gains". West Virginia MetroNews. Retrieved November 10, 2016. ↑ "Local Exit Polls — Election Center 2008 – Elections & Politics from CNN.com". CNN. ↑ "SurveyUSA.com". SurveyUSA.com. Retrieved July 31, 2010. ↑ "Rasmussenreports.com". Rasmussenreports.com. Retrieved July 31, 2010. 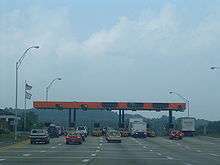 ↑ "West Virginia Department of Transportation, accessed June 9, 2006". Wvdot.com. Retrieved July 31, 2010. ↑ de Hart, A, and Sundquist, B., Monongahela National Forest Hiking Guide, West Virginia Highlands Conservancy, Charleston, West Virginia 1993. ↑ "West Virginia Rails-to-Trails Council, accessed 9 June 2006". Wvrtc.org. Retrieved July 31, 2010. ↑ Southern West Virginia. "Hatfield and McCoys Trail web site, accessed June 6, 2006". Trailsheaven.com. Retrieved July 31, 2010. ↑ "WV White Water web site, access June 6, 2006". Wvwhitewater.com. Retrieved July 31, 2010. ↑ "Cass Scenic Railroad web site, accessed 6 June 9, 2006". Cassrailroad.com. Retrieved July 31, 2010. 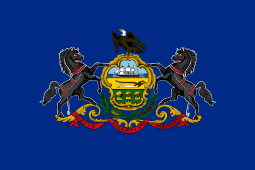 ↑ "Potomac Eagle Scenic Railroad, accessed June 6, 2006". Potomaceagle.info. February 20, 2010. Retrieved July 31, 2010. ↑ Gossett, Dave (January 15, 2009). "Fort Steuben Bridge permanently closed". Weirton Daily Times. Archived from the original on February 2, 2009. Retrieved February 2, 2009. ↑ Bailey, Kenneth (April 21, 2011). "Capital Cities". The West Virginia Encyclopedia. ↑ "Country Roads, Take Me Home" (PDF). Retrieved 15 July 2014. ↑ "West Virginia Lightning Football". Wvlightningfootball.com. Retrieved January 29, 2012. ↑ "Appalachian String Band Festival". Wvculture.org. Retrieved July 31, 2010. ↑ "Vandalia Gathering". Wvculture.org. Retrieved July 31, 2010. ↑ "Augustaheritage.com". Augustaheritage.com. Retrieved July 31, 2010. ↑ WVgazette.com Archived April 10, 2008, at the Wayback Machine. ↑ West Virginia Symphony Orchestra Archived November 6, 2008, at the Wayback Machine. ↑ West Virginia Cultural Center. Retrieved January 19, 2006. ↑ West Virginia Division of Culture and History. Retrieved January 19, 2006. ↑ In 2001, Mountain Stage debuted a television show featuring many of the radio program's guests. Mountain Stage. Retrieved January 20, 2006. ↑ Greater Morgantown Convention & Visitors Bureau. Retrieved January 20, 2006. ↑ Stephen Ballman (October 30, 2002). "Footmad". Footmad. Retrieved July 31, 2010. ↑ West Virginia Dance Festival. Retrieved January 20, 2006. ↑ "Augustaheritage.com". Augustaheritage.com. July 4, 2010. Retrieved July 31, 2010. ↑ "West Virginia State Folk Festival". Etc4u.com. Retrieved July 31, 2010.